In our first episode after a brief hiatus, Steve and Jack reflect on some of the work they have been doing over the last few weeks – Steve’s PDCs in Uganda and his work with the Norwegian Refugee Council, and Jack’s continuing research into the ‘spiritual’ and ‘experiential’ dimensions of Permaculture. The main bulk of the episode consists of an edited recording from a public discussion hosted at The Cross Keys in Llanfyllin. The discussion was structured around the themes of historic buildings and co-operatives, and Sector39’s recent work in Uganda. We are going to do more sessions like this in the coming weeks. 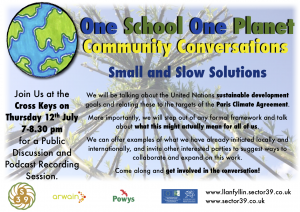 The next public discussion will have the theme of ‘Small and Slow Solutions,’ and will take place at The Cross Keys, Llanfyllin on Thursday 12th July, 7-8.30pm. Jack’s Permaculture and Extraordinary Experience Survey.